Braving today's masculinity maze, with its contused images that distort real manhood, requires courage and wisdom. 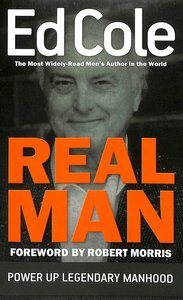 Edwin Louis Cole, as a mentor, friend and spiritual father, declares a model for manhood that is infallible, functional and yet feasible - the manhood of Christlikeness: Real Man rips apart unfulfilling stereotypes, smothers the pressure of unrealistic demands, exposes cheap substitutes and sordid imitations of true manhood - while giving a man the power he needs to obtain the spirit and conviction of being a real man. Learn how to: Maximize your masculinity, Discover the manhood of Jesus Christ, Get and stay on top, Determine your heart's direction, Achieve fulfilling accomplishment, Clarify your role as leader, husband, father, friend... Real Man addresses the full range of a man's life û marriage, finances, friendships, success, failure, parenting and spirituality. Jesus Christ overcomes substitute manliness and sets the standard for real manhood to help men be real. Book jacket. Dr. Edwin Louis Cole (1922-2002), known as "the father of the Christian men's movement," was called by God to speak with a prophetic voice to the men of this generation. To that end, he founded the Christian Men's Network, a ministry that continues to strengthen men by reaching thousands each month with the reality that manhood and Christlikeness are synonymous. As a pastor, evangelist, missionary, business executive, and denominational leader, Dr. Cole, together with his late wife, Nancy, served the Lord in ministry for more than fifty years until his death in 2002.